Domenic recorded this album shortly after Bush broke up, and his group of musicians included all of his former bandmates. Consequently, this is probably the closest we'll come to hearing what a second album from Bush would have sounded like. Troiano's first solo album is also his most mainstream effort. The album sleeve features rustic artwork and photos of Dom and his friends/bandmates, giving the LP a tight-knit, "family affair"-type feel. The cover contains a picture of Dom looking like he's posing for a mug shot. In the background is his Fender Telecaster with custom pickup job. Although the level of musicianship is high, the focus of the album is its mainstream sound and pop-oriented arrangements. A few of the songs might have gotten airplay if Dom's voice was tailored more for Top 40 radio. The album opens with "The Writing's on the Wall," which was later covered by the '70s band Skylark. It's a straightforward, funky pop-rock song with a touch of jazz, and it is probably Dom's best effort at writing a hit single. "The Answer" is a high-energy number with an extended instrumental break in the middle. 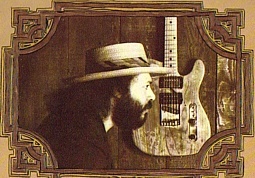 The break features some of Domenic's best recorded guitar work; it's regarded in some musician circles as a highly notable rock/fusion solo. One of Domenic's best songs, no doubt. Opening with a short organ solo, "Let Me Go Back" is a sentimental song about playing music with the good ol boys, back in the good ol days (the Club Bluenote in the '60s). "I Just Lost a Friend" is quite personal, and it was actually released as a single to promote the album. For a long time I wondered exactly who the song was about ("He has been so close to me, though we've never met...I just lost a friend I never knew..."). The liner notes of The Toronto Sound reveal that the song is about the death of guitarist Wes Montgomery. It's a very good song, but too deep for radio. "Try" is a decent Bush oldie. It is one of many motivational songs that Domenic has written. Laced with a country influence, "The Wear and the Tear on My Mind" is another great attempt by Domenic to write a hit. It's short, catchy, and has an amazing chorus with great harmonies. "Is There No Rest for the Weary" is a cool, R&B-flavored song featuring exuberant background vocals from Shawne Jackson. "Hi Again," a weird song about a blackout, is appropriately trippy. "356 Sammon Ave." is a short instrumental, and is actually quite cool. It sounds like a jazzy organ solo, but it is actually a guitar played through a Leslie speaker. Last is "Repossession Blues," another oldie from Domenic's early '70s band, Bush. The structure is basic blues, played very slowly and with great care. I really like Whitey Glan's percussion work in the instrumental break. Some horns enter near the end and give the song a real kick for the finale, ending the album on an energetic note. All in all, a highly entertaining album. Domenic Troiano's first solo LP since splitting from the James Gang is a resounding adventuresome musical delight. There is an intrinsic viability and high-spirited drive apparent here. His guitar licks are brilliantly accomplished and his high-flying vocals seem to be almost self-propelled. On first assessment, "The Answer," "Hi Again," "Repossession Blues," and "The Writing's On the Wall" seem to be sure winners.